​Are you in a good relationship that you want to make great or a stale relationship that needs a little more spice? Tired of feeling stuck in the same old fight? Want to build closeness and connection with your partner? Based on the bestselling book by Dr. John Gottman (and suitable for couples of all kinds not just married ones! 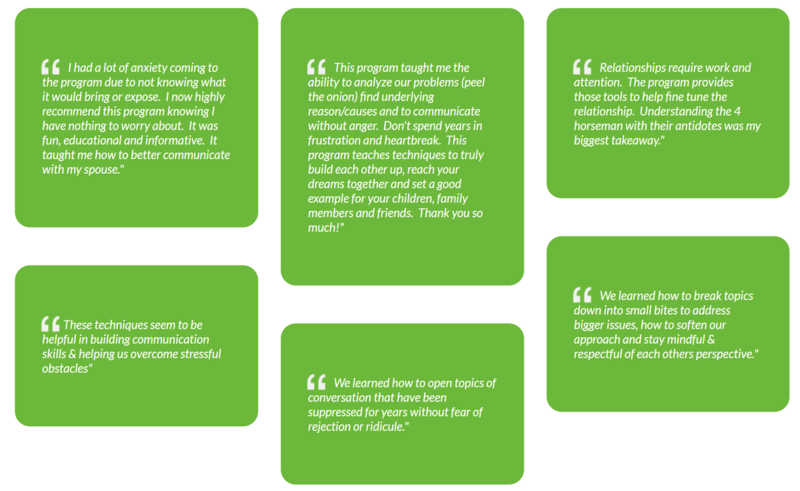 ), The Seven Principles Program is a perfect workshop for couples who long to feel more connected and positive about their relationship but don't know where to start. Research shows that on average, couples wait six years from the first signs of problems before they seek help. The workshop is designed to strengthen your marriage and/or relationship. If you have a strong relationship, this workshop will provide you with insights and tools to make it a great one. If your relationship is distressed, this workshop will provide a roadmap for repair. This workshop will equip you and your partner with knowledge and skills that have been scientifically proven to improve relationships. You will also learn about common behaviors that have been linked to relationship problems and divorce along with simple but powerful strategies that will keep your relationship strong and connected. 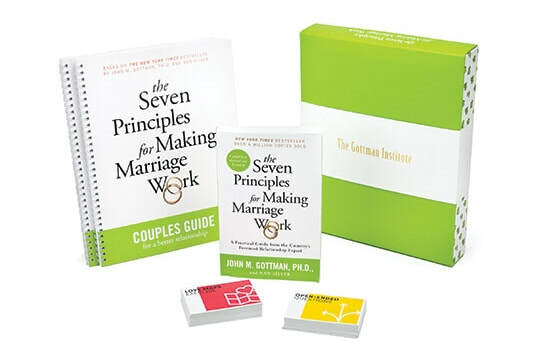 The Seven Principles Workshop for couples is based on the internationally acclaimed research of Dr. John Gottman as presented in his New York Times bestselling book--The Seven Principles for Making Marriage Work. This educational workshop has been offered across the US and internationally, and has strengthened the relationships of tens of thousands of couples. It's specifically designed to help couples improve their friendship, and learn powerful communication and conflict management skills. The workshop includes lectures, demonstrations, videos and private couples exercises. The activities are fun, insightful and informative. The Seven Principles Program format includes lectures and private couple exercises. Participants will not share personal problems in front of others. ​Workshops fill up FAST because they are limited to ONLY 5 couples per workshop. No. The workshop is intended for couples. Approximately 1/2 of the workshop is dedicated to exercises that you will do privately as a couple during the workshop. No problem. Couples sit as an audience during the lectures and only engage quietly together. There is no group work and no mandatory sharing. No more than 5 couples attend. There are no prerequisites to attending a couples workshop. The workshop is self-contained and is appropriate even if you’ve never heard of Dr. John Gottman and his work. However, it is highly recommended (not necessary) that you first complete The Relationship Check-Up before the workshop to get the best results. 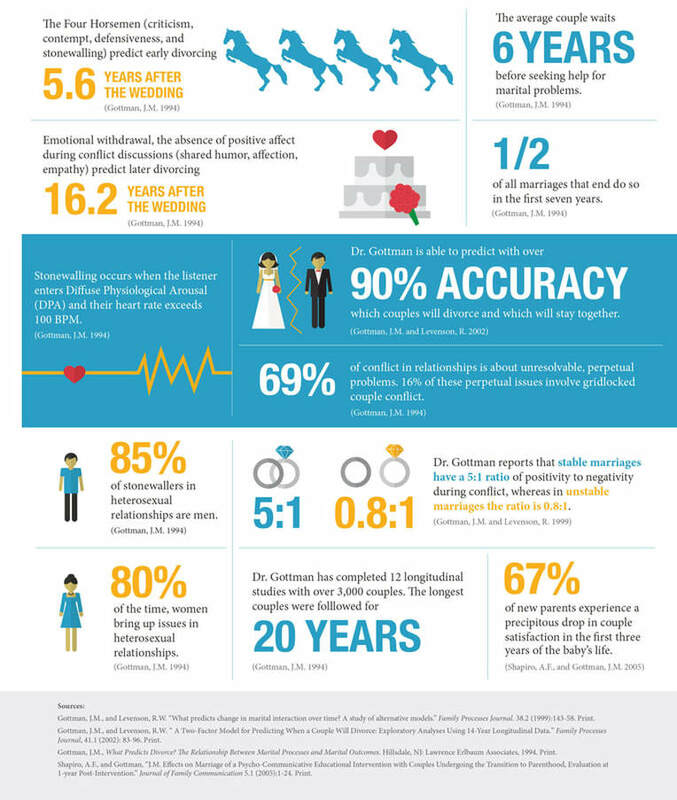 The Gottman Relationship Checkup is an online tool that is comprised of 480 questions which cover five categories of importance to healthy and satisfying relationships. Each partner is provided a private (and separate) link to the Checkup, and once each partner has completed the questions, a report is generated with the results of your current relationship health. This report is sent directly to Denise and she will then provide the results of your assessment during your 90 minute live video coaching session. The workshop is self-contained; no pre-reading is required. Some couples report that reading The Seven Principles enhanced their workshop experience by providing a foundation in the research concepts and applications. If cancellation is made on or before April 18th, a full refund minus a $75 processing fee will be given. If your cancellation occurs after the April 18th deadline, your registration will be converted to a credit, good for a full year, that can be applied to future workshops. The Seven Principles Workshop will be canceled due to inclement weather ONLY if the Venue where the event is being hosted is closed, if there is a government ordered travel restriction, or if the presenters are prohibited by weather from being there. If the event is canceled due to inclement weather, your registration fee will be applied to the rescheduled date or to another Seven Principles Workshop of your choosing in the next 12-month period. Any travel expenses that may have been incurred cannot be refunded. If the event is held, but weather conditions prohibit your safe travel so you are unable to attend, your registration fee will be applied to another date of your choosing in the next 12-month period. Whenever possible, cancellation announcements will be posted to the DeniseLevyBSW.com website homepage and participants will be notiﬁed by email or phone. Thank you for your understanding. Denise Levy, BSW specializes in the art and science of getting you out of your own way! Denise graduated from the University of West Florida with her degree in social work and is a Certified Life Coach, Professional MatchMaker & Business Mentor. Denise is considered one of the top Relationship Experts in the field and is a Trained Gottman Leader. Denise has the perfect combination of education, professional and personal experience and she offers life coaching, matchmaking and mentoring based on mindfulness, positive psychology, and cognitive behavioral techniques. Denise is a proud member of the NASW, National Association of Social Workers and currently serves as Vice-President on the Board of Directors for NAMI (National Alliance on Mental Illness) Okaloosa & Walton County affiliate. NAMI is a national non-profit mental health consumer advocacy organization. NAMI Emerald Coast is a local affiliate of National NAMI. 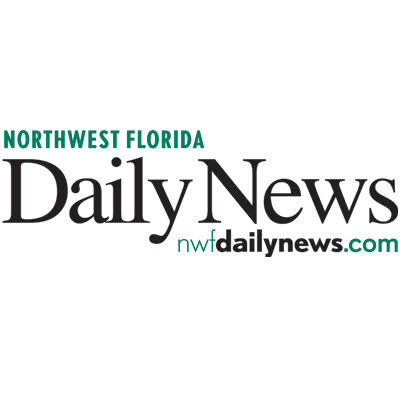 Denise also volunteers as a facilitator for the NAMI Family Support Group in Navarre, FL. 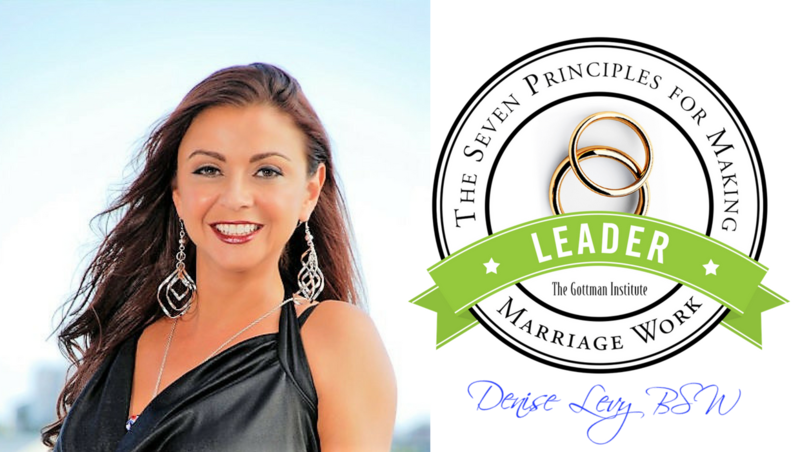 As a Relationship Expert, Denise is a Trained Gottman Leader and loves teaching The Seven Principles for Making Marriage Work program. Additionally, via the National Resource Center for Healthy Marriage & Families, Denise has completed Conflict Management for Core Healthy Marriage & Relationship Skills. Denise works with couples nationally via HIPAA compliant live video platform. Denise also holds certification as a Cognitive Behavioral Practitioner and is trained in Meditation for Stress & Anxiety Reduction through Trauma Informed Training. ​Denise is the owner of MatchMaker Gulf Coast in Destin, FL and is the on-staff Life Coach for The Bindu Institute. Through MMGC Denise offers Life Coaching for both singles and couples nationally in addition to matchmaking for her single clients. Denise was featured in the Lifestyle Section of the Sunday Daily News for National Romance Awareness Month. Click Here to view the online article. Subscribe to receive your FREE 7 Week Guide to Creating Fondness & Admiration! DISCLOSURE: We want to take a moment and advise you that this workshop is psycho-educational, meaning that it was designed to serve as teaching and guidance for you and is not couples therapy. Educators are available to assist with class exercises, not to conduct therapy. If you wish to pursue counseling, we suggest that you visit the Gottman Institute website at www.Gottman.com to find information that will help you locate a couples therapist who is trained in Gottman Couples Therapy or email info@DeniseLevyBSW.com for a referral.